Craps for Dummies... and er... You! Craps For Dummies and er….You! Craps can seem intimidating. It’s littered with strange words, odds, and numbers that seem out of context. Meanwhile, practiced players stand around the table cheering, groaning and yelling words that seem to make little sense. “Yo eleven” “Horn” “Press my hard 4’s” and all sorts of sayings all being shouted seemingly at once. Money is being tossed around the tables and the dealers are placing it all over the table. What is going on and how the hell does this all work? Even seasoned gamblers can feel intimidated by the craps table the first time they step up to place some bets. The good news is that craps is as simple or as complicated as you make it. Just because there are dozens of types of bets doesn’t mean you have to make all of them. In fact, many longtime players stick to two or three betting options (pass line bets and pass line odds bets, more explained below). This will become clearer to you as you read through this Craps 101 Guide and tutorial. By the time you’ve finished reading this tutorial, you’ll not only know how to play, but also how to maximize your chances of winning craps! Along the way, I’ll point out a couple legitimate online casinos where you can play for real money with 100% confidence that you won’t become a victim to casino shenanigans. That alone is worth the price of admission. Let’s start by taking a quick look at where craps came from. Craps History: How Did The Game Originate? According to Wikipedia, the game is a derivative of an early British dice game called hazard. In this case, “early” means dating back to the Crusades. Apparently, when folks weren’t killing each other in Pope-sanctioned wars, they were playing an early form of craps. Hazard is a complicated game. Believe it or not, as confusing as craps may seem (if you’re a novice), it’s actually a simplification of the former game’s rules. Today, you’ll find craps tables in nearly every casino across the U.S. Gamblers in this country tend to love the game due to its fast pace and the natural camaraderie that forms among the players. That said, it isn’t as popular in other parts of the world (neither is hazard for that matter). But most casinos still offer at least one or two tables for their customers. You’re probably interested in playing craps online. Rest assured you’ll have no problem finding gambling websites that offer the game. The challenge is finding sites you can trust. If you’ve read any of my other gambling tutorials, you’ll know my favorites are Bovada Casino and Slots.lv. Let’s talk about how to play craps. The game follows a customary sequence of events. First, you place a Pass Line Bet in anticipation of the shooter’s Come Out roll. Then, you watch as the shooter rolls the dice. If he shoots a 7 or 11, you get paid on your Pass Line Bet. If he shoots a 2, 3 or 12, you lose the Pass Line Bet and the round ends. If the shooter rolls a 4, 5, 6, 8, 9 or 10, the number rolled becomes the Point. With the Point established, you have the opportunity to place an Free Odds Bet behind your pass line bet(more on this later). If the shooter rolls the Point, you get paid on both your Pass Line Bet and Free Odds Bet. If the shooter rolls a 7, you lose both bets. You can also wager Place Bets. These are bets on whether the shooter will roll a 4, 5, 6, 8, 9 or 10 after the Point has been established, and before rolling a 7. If the shooter rolls the number on which you’ve wagered a Place Bet, you get paid on that bet. If (or when) the shooter rolls a 7, you lose your Place Bets along with your Pass Line Bet and Free Odds Bet. The table is cleared and the dice are given to a new shooter. You’re then allowed to make another Pass Line Bet in anticipation of the new shooter’s Come Out roll. 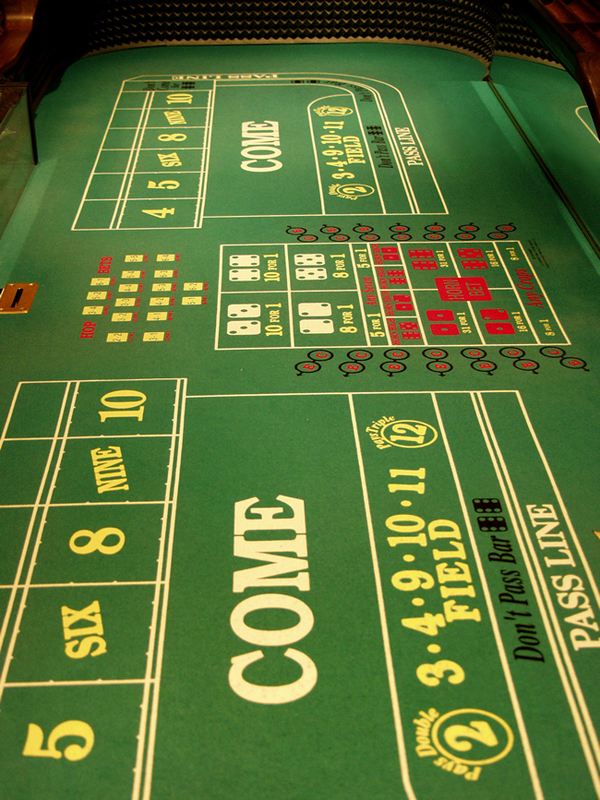 The above may sound confusing if you’ve never played craps. I promise you, it’s simpler than it seems. In a few moments, I’ll tell you where you can play craps online for free so you can learn the ropes without putting your money at risk. The game can be as simple or complicated as you want to make it. Start simple by placing a pass line bet and once the point is established make what is called the ‘odds bet’. Essentially this an even money bet that you place behind your pass line bet on the table. The casino itself likes to keep this bet on the down low because of the even money odds. There is not even a marking on the table that says you can place this bet, you just have to know about it. With that said, there are a ton of other bets you can make. Let’s look more at them here on my playing craps strategy guide and top 10 craps tips articles. The craps table is usually the liveliest section of a casino. If you’re playing blackjack, Pai Gow or Three Card Poker, and hear people yelling and clapping, you can bet the racket is coming from the craps tables. When you approach the tables, you’ll hear people calling out things that seem to make no sense (at least to the novice). Craps has its own language. It’s one of the reasons newbies feel intimidated. Below, you’ll find the most common terms used at the craps table, along with their respective meanings. Keep in mind, you don’t need to be fluent in the language. You just need to be familiar with the following phrases. Any seven – a bet placed on whether the next roll is a 7. Big 6 / Big 8 – a bet placed on whether a 6 or 8 is rolled before a 7. Come Bet – like a Pass Line Bet, but made after the come out roll. Come Out roll – the first roll made by a shooter. Free Odds Bet – bet placed behind your Pass Line Bet after the Point has been established. It is the best bet in craps. Pass Line Bet – bet placed before the Come Out roll. Point – 4, 5, 6, 8, 9, or 10 rolled during the Come Out roll. Seven out – the shooter rolls a 7, thus ending the round. Snake eyes – pair of ones (1s). Again, there are many other terms used in craps. But if you familiarize yourself with 10 phrases above, you’ll know as much as you need to in order to play the game with confidence. Playing craps on the internet comes with notable benefits. Especially as you are learning the game and how it works. First, you don’t have to travel to a traditional casino. That alone is a big advantage. Nor do you have to pay for a hotel room or food. Second, you can play at your own pace rather than trying to keep up with the dealers, boxman and stickman (not to mention the experienced players). That’s invaluable if you’re learning the ropes and need time to find your rhythm. Third, you can play craps whenever you want for as long as you want. It’s not like traveling to a land-based casino and feeling obligated to spend time at the tables just because you went to the trouble of getting there. Instead, in the comfort of your home, you can log onto Bovada or Slots.lv and play a round or two at your convenience. Fourth, you don’t have to fear making newbie mistakes that cause others to look at you strangely. Fifth, you don’t have to tip the dealers if you hit a winning streak. Sixth, you can bet a little as $1. In Las Vegas, most of the casinos on the Strip have a $5 minimum bet. That might not sound like a lot, but you’d be surprised at how much cash you can have on the table (and at risk of loss) at one time with a $5 minimum. Some casinos, such as the Wynn Resort, Mandalay Bay and Caesar’s Palace, impose $10 minimum bets. Seventh, if you’re a nonsmoker, you won’t have to put up with the cigarette smoke that’s a constant presence in many traditional casinos. Of course, there are a couple drawbacks to playing online. First, you won’t be able to enjoy the clamor of the crowd when a shooter is on a winning streak. (Of course, you also won’t have to endure the inevitable groans when the shooter rolls a 7. Second, you won’t be able to receive your winnings immediately. You have to request a withdrawal from the gambling website. Your funds will be sent to you in the form of a check. Those two drawbacks are a small price to pay given the advantages of playing craps at home. Both sites will give you $1,000 in practice money. You can then use that money to place various types of bets on craps. That gives you an opportunity to learn how to play without fear of losing your own cash. What happens if you lose the $1,000? No problem. Just refresh your browser and you’ll find another $1,000 in practice money waiting for you to use as part of your craps education! There’s a lot more to cover regarding how to play craps – and specifically, how to play to win. To that end, use the links below to familiarize yourself with the most important aspects of the game.